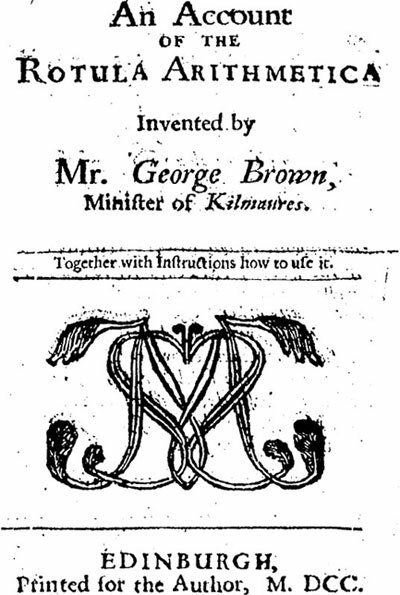 George Brown (1650-1730) is a Scottish arithmetician and minister, known for the invention of an arithmetical instrument, called Rotula Arithmetica—a device for simple addition, subtraction, multiplication, and division. Brown described his instrument in the book An Account of the Rotula Arithmetica (see a copy of the book), published in 1700 in Edinburgh (see bellow the title page of the book). In the same year 1700 he published also another book, called A Specie Book, to be used in conjunction with the Rotula Arithmetica. 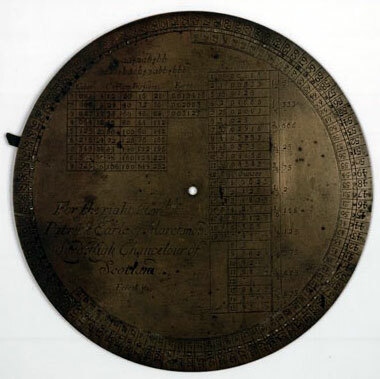 The book contains currency tables, because many of the coins were not Scots-minted silver, but foreign currency, legal tender in Scotland, at values fixed by the Privy Council and Parliament. Several copies of the instrument were made, but it is doubtful that Brown himself made the rotula, he probably employed an engraver. The instrument in the lower photo is inscribed for the right Honble Patrick Earle of Marchmont, Lord High Chancelour of Scotland, Feb 28. 1699, as Brown was clearly searching for an influential patron (Sir Patrick Hume (1641-1724) was a Scottish statesman). The Rotula consists of two parts: a circular plain (movable plate), moving upon a center-pin; and a ring (fixed plate), whose circles are described from the same center. The outermost circular band of the moveable, and the innermost of the fixed, are divided into a hundred equal parts, and these parts are numbered 0, 1, 2, 3. etc. Upon the ring there is a small circle having its circumference divided into ten equal parts, furnished with a needle which shifts one part at every revolution of the moveable. By this simple instrument the calculations can be done by moving the plate around the axes and accounting the numbers, as the four arithmetical operations can be performed not only of integers, but also of decimals finite and infinite. George Brown was a good mathematician, but a poor minister. He wasn't zealous in prayers and was frequently charged for exercising discipline and marrying without proclamation. He was banished from Edinburgh from 1692 until 1698, for "... he had not prayed for their said majesties and in the terms aforesaid and having refused to do the same in time coming...". Brown is an author of several other mathematical books, popularizing the decimal notation, as the last of them, Arithmetica Infinita, was endorsed by famous Scottish mathematician John Keill. George Brown died in 1730 in London.